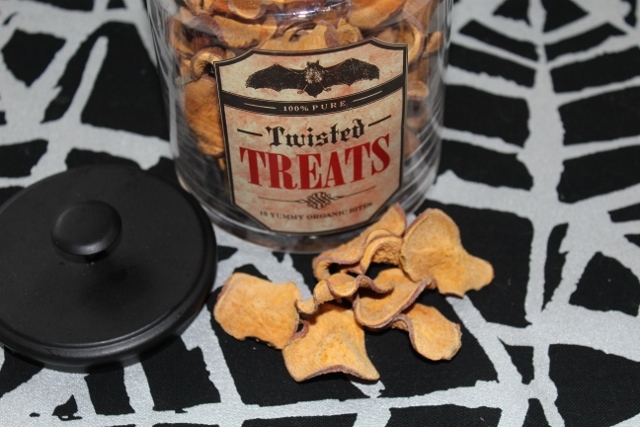 I don’t know what makes these dog treats spooky. Chalk it up to false advertising to get you to read this post since it’s Halloween week. I mean, these little sweet potato treats are kind of shriveled, like a dead man’s ear or sloughed off skin or something, right? And the jar I used – the jar is Halloween-y. I first started making these treats a while ago. All those dog treat recalls have gotten me nervous about what goes into those little bits that Phoebe eats. I’ve made dog treats before, even the kind where you roll our the dough and cut out a bunch of little bone shaped mini cookies. It’s a fun treat for our pup once in a while, but those bone shaped dog cookies take FOREVER to make. These sweet potato treats take some time in the oven, but the actual hands on time isn’t more than 10 minutes. I always start by scrubbing the sweet potatoes free from dirt. Then, carefully, slice the potato pretty thin with a mandoline. In full disclosure, I always ask Dan to do this part becayse using the mandoline makes me so nervous. Lay the slices in a single layer on a silpat on a baking sheet. I’ve found that one potato fits onto one pan. Bake at 200 degrees for two hours. Flip each treat, then continue baking for another two hours. Once done, take the pan out of the oven, and let the slices sit on the pan for a while, at least a couple hours or so, longer if you can, to allow the potatoes to try out. Store in a sealed jar and let your dogs enjoy! I’ve found these treats last for quite a while in the jar. However, if you’re making more than one sweet potato, I’d suggest giving some away to a pal with a pup. « The Dining Room – Revealed!